In this tutorial you are going to learn how to create a cartoon online which is both fun and easy if you use the right website. First you need to navigate to “www.toondoo.com”. Hover over the “Toons” option in the top left and in the menu that appears click “Create toon”. You will be redirected to a new page and you need to click “New to ToonDoo”. Enter a username you want, as well as a password and your email address, then click “Register”. You will now be registered with the site and you will need to enter the details you just created and click “Sign in”. 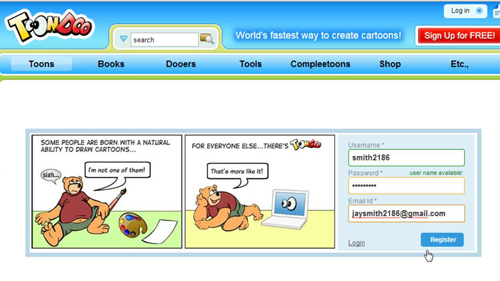 Once again, hover over the “Toons” tab and click “Create toon”. A new page will load and you will need to click on the type of layout you want. The editor will start to load and this can take some time – this loading speed will depend on the speed of your internet connection. Once the editor has loaded you will see the number of frames you chose to create as well as numerous tabs for inserting items above. When you hover your mouse over one of these tabs you will see more options that are available, you simply need to click on the option you want and then even more options will appear below. Select the character or item you want to add and drag them onto the canvas. You can then use the options below the canvas to make changes to the object placed onto the page. In this example we can change the emotion of the character by clicking on this button. You are now able to design your own cartoon and this requires some creativity. Now we will just look at saving our very incomplete creation, so you know how. Hover over the icon in the top left of the screen and click save. In the popup window enter a title, description and some tags. Save the cartoon and then click OK and that is how to create a cartoon online.